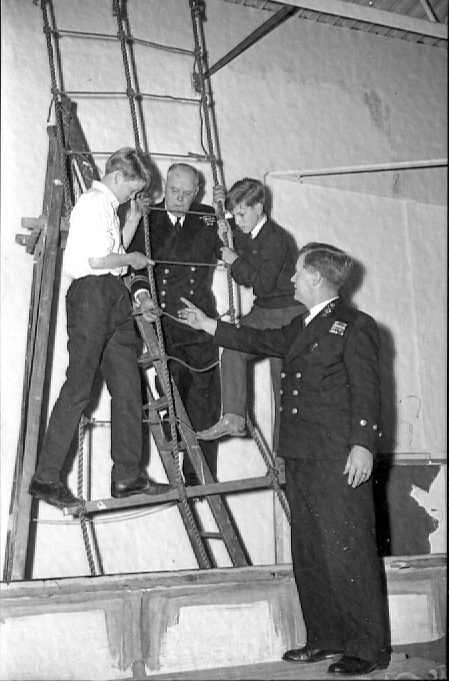 These two distinguished-looking officers show a couple of keen young boys around some rigging, which looks like it might have been rigged up in the school hall or gymnasium. Do you remember this event? Perhaps you even joined the Royal Navy after leaving Clarendon School? We’d like to hear your comments below. This page was added on 03/03/2010. I think that’s me on the left and it looks like Larry Major on the right. I remember being taught by the Navy personnel how to use the ‘Boatswains Call’- a small brass whistle- in order that I might pipe the Admiral (Roy Blackwell) aboard. Great memories. Thanks to Geoff Holt for forwarding me an email he had received from Jenny Clay who saw the picture in the first place.